Free subscriptions are available to qualified recipients in Canada. Just complete the form below! US and overseas subscriptions are welcome and will receive our digital edition, as well as our very popular monthly e-letter. Any reader by unsubscribe at any time, and we NEVER sell or pass on your email address to any third party. In Canada, we are 100% "CASL" compliant. Do you wish to receive a free subscription to Wood Industry Magazine? IMPORTANT NOTE: Your email address will be used for subscription renewal and direct magazine related purposes only – It will not be passed on, rented or sold to any third party. Please note that all Wood Industry subscribers will receive our very popular monthly e-letter. You may unsubscribe at any time, by clicking the unsubscribe link found in every email we send. 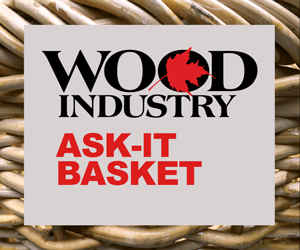 Free subscriptions to the print edition of Wood Industry are only available in Canada. Readers at non Canadian addresses are more than wlecome to register and post comments, as well as for our e-letter and digital edition. To prove you're a real person, please enter the two words you see, in the box above.